These are the people you are most likely to meet if and when you make contact with St Ives Free Church. ministry with her husband Peter at Sawston Free Church, and before that at St Neots URC. Originally from Canada, Catherine trained as Social Worker before entering the URC ministry. 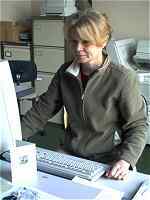 Gill has worked in the Church Office since 1996. Her job is very varied and includes dealing with day to day matters relating to the church building, its volunteer helpers and its many visitors. She also deals with hiring of the building, and assists the treasurers, the church secretaries and the Ministers as necessary.